This top is finally together -- I was getting tired - so many little pieces, and have named it "ENUF!" There are well over 3000 pieces, and for so many pieces, you'd think it huge, but NO, it's about 51"x 74" -- a lotta work for a small quilt! It's from Jackie Robinson and she calls it Strip and Slash. Getting those chevrons to "close" at the top and bottom took extra thought and planning. There are also a few almost-quarter-square-triangle blocks at the top and bottom inside and outside points. That took planning! I would not have thought of it if Kathy G., a new quilt member, had not made that suggestion! Then it needed more lights around the chevrons so I made MORE lights, then the border needed more lights, so I made MORE! Now I've called it DONE, and stay-stitched around the edges to hold them in place while wrangling the quilting - to be started soon. Our snow is almost gone from most places and the last few days were so warm, there are puddles, messes, mud everywhere. I wanted to get to my favorite quilt shop to purchase backing, but my LQS is waaaaaay out in the country, on gravel roads. Traveling those roads in this weather is for fools only so I forced myself to "make do", and stayed home. I'm relieved that conditions made me stay home and use what I had! There's good in everything, isn't there? I've been cutting extra fabric into 10 1/2 in. squares (below) and occasionally use the squares for a backing. I already had over 150 pieces of 10 1/2 in. squares -- time to stay home and make the back from what I already have. I pulled out the blues, lights and mediums, pressed them and laid them all out in one direction; i.e. all cross grain in my case. 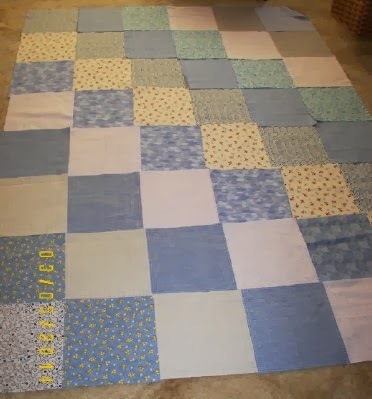 I needed 6 x 8, (= 60" x 80") or 48 squares. 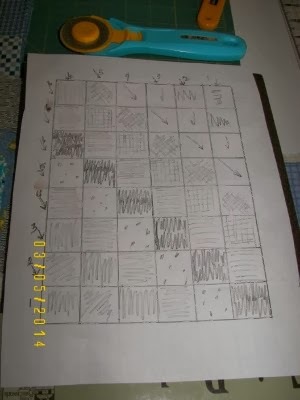 Then I made a quick drawing (below) of my diagonal plan, counted how many squares of each color would be needed. I most cases I had enough of each fabric, but added some that were close in value. After all, this IS patchwork!! If I had needed an uneven number of squares across and down, wouldn't it look great as Trip Around the World??? Here is it, laid out on my design floor. This sews together FAST, if I stack each row, put a pin pointing either right or left on the top square, take them all to the sewing machine and just get sewing, pressing the seams either right or left for speed. Whew! Dreaded basting is next (my least favorite quilting job). You might consider using some of YOUR stash for the backs. Getting the fabric cut into a usable size is the first hurdle. I tried using chunks for the back, but somehow, it just was NOT attractive, or balanced and I cut them into squares instead. 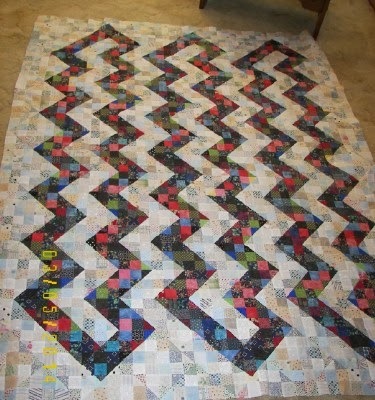 This backing idea came from Bonnie Hunter of Quiltville.com, and I've made 4-5 like this. Thanks Bonnie! I love this design... great job! Congratulations, you're alllmost done! Woooo hoo. 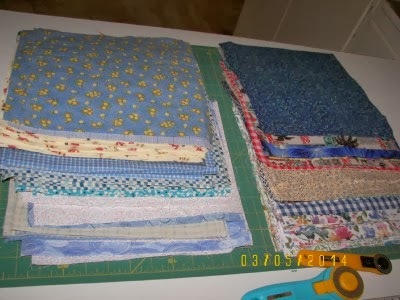 Love the idea of making a backing from a pattern of 10 1/2 inch squares. None of my long rulers are that wide. What ruler do you use to cut the squares? That is the best ever setting for Split 9-Patch!! I make pieced backings all the time but I've never done one with all-the-same-size squares. I know that Bonnie does that a lot. ENUF!!! I LOVE it!! Great name for a great quilt!